Howdy! My name is Ray and I’ve been a fishing guide in Alaska since 1991. My parents brought me fishing in Alaska when I was 14 years old and ever since I knew this is what I wanted to do. I grew up in Houston Texas and moved to Soldotna in 1996, after graduating from the University of Houston Conrad Hilton College of Hotel and Restaurant Management. I have close to 20 years of Alaska guiding experience and look forward to another 30 years to come. I am currently on the Board of Director’s of the Kenai River Professional Guide Association and a Kenai River Professional Guide Association Master Guide. My wife’s name is Gina. She is a professional engineer by day and by evening is camp cook, hospitality coordinator and head accountant. 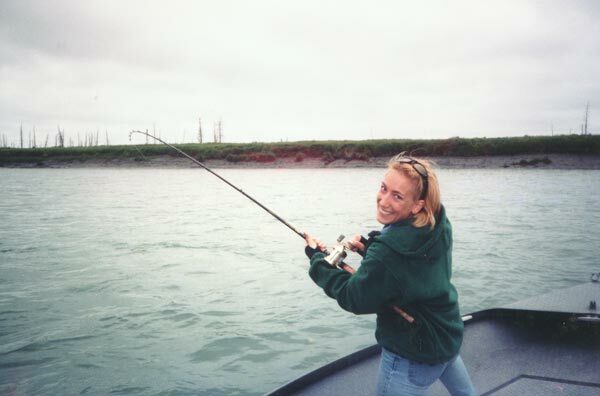 Gina was born and raised in Kasilof, Alaska and grew up fishing both the Kenai and Kasilof Rivers. If you have questions about the area, its history or other things besides fishing you might want to do while you are visiting, ask Gina. She’ll easily share a fish recipe or a story of growing up in Alaska.